Is marching an effective way to protest? Let us consider how political change is achieved within a liberal-democratic social framework. The answer is: through votes, through the establishment of a body of citizens which firmly supports a given policy and which is large enough to not simply be ignored by politicians. Thus, in order for someone to bring about change, they must convince as many people as possible of the truthfulness and validity of their message. Here are several reasons why I believe demonstrations fail to do so. Firstly, there is something inherently immature about having to spread your message by screaming slogans and waving signs. It does not require intellectual capability, there is very little debate or argumentation involved. A demonstration is ultimately a display of emotion. Even if someone has something reasonable and constructive to say, this is made difficult by the event’s format. There are even examples of protesters flat out refusing to engage. We saw this during the March for Our Lives when the protest organizers in Austin, Texas specifically instructed attendants not to talk to counterdemonstrators. Repeating slogans is a great way of preaching to the choir, but for actual ideas to spread, one requires superior methods of communication. Secondly, demonstrations tend to be messy and disruptive. They oftentimes lead to piles of rubbish on the streets, vandalism, traffic jams etc. It is argued that protests should have a degree of provocation so that they can raise awareness of relevant social issues. We must remember, however, that change can never be achieved by alienating the local community. Most people are not politically-minded and will be infinitely more annoyed by seeing their daily lives disrupted, than they will be inspired by your “noble message”. Thirdly, a political cause needs to be promoted by the smartest, most eloquent and most respectable people possible. With demonstrations you get the exact opposite of this. Healthy members of society usually have a lot of things to worry about in their day-to-day lives: career, family etc. It is less likely for them to attend demonstrations. The people who tend to be overrepresented at such events are rebellious kids who think they know everything, narcissists looking for attention as well as professional revolutionaries and agitators; in short, people who are likely to turn any movement into a parody of itself. In 2017, during the Women’s March the average somewhat-conservative American mum came face to face with thousands of college girls wearing genitalia hats and waving signs with slogans like “P*ssy Power!”. Is she going to see these people as capable of representing her interests or is she going to be taken aback and dismiss the protests before having the chance to rationally examine their argument? The latter is very likely. As a conclusion I would like to state that I don’t think demonstrations are completely useless, I just believe that they are overrated in regard to the effect they produce. Petitions, leafleting, journalism, TV appearance, conferences, public debates etc. are all ways of spreading ideas which are more civil, intellectually engaging and less messy than waving signs and screaming like there’s no tomorrow. 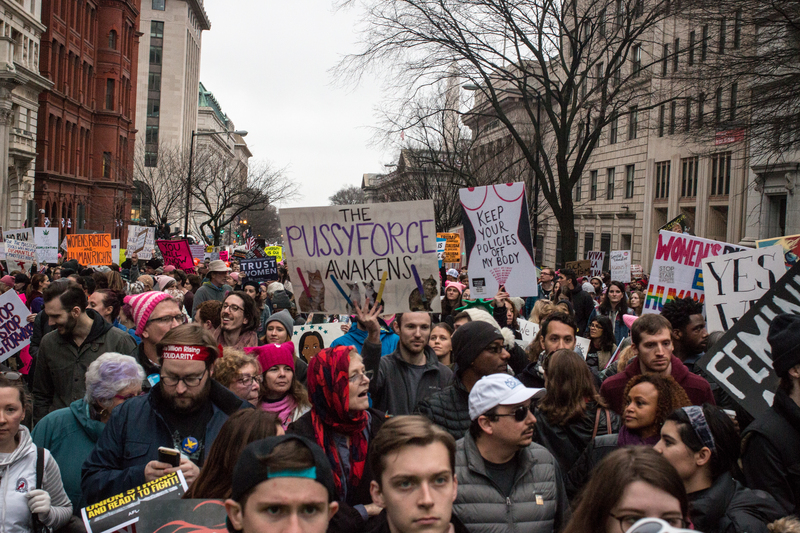 Over the past year, we’ve seen a series of powerful marches which have been more than protests; they’ve been evidence of growing political movements. It seems an apt time to recall the words of Martin Luther King: ‘In the End, we will remember not the words of our enemies, but the silence of our friends.’ When we see injustice, a lack of marching seems like a tacit acceptance that we’ve come to expect nothing better. One of the perennial questions about demonstrations is, of course, does marching show power or powerlessness? Perhaps it’s a sign of both. But with each new group of people who take to the streets to protest injustice – from schoolchildren to barristers, from disabled people to women’s rights advocates – each march becomes part of a larger energy saying that injustice has been ignored for too long. Will the US Congress pass 2nd Amendment reforms because thousands marched to the Capitol? Whilst change is always painfully incremental, Parkland might be different. It’s difficult to ignore thousands of children organising themselves in a way that’s never been seen before. Especially when the people marching are able to provide articulate, impassioned arguments for their cause. So will it bring change? Maybe another way to consider it is, what do we mean when we ask whether marching is effective? Perhaps a key issue is the way that being part of a movement can change someone’s perspective about their ability to influence; the Parkland protesters have become politically engaged at a much earlier age than most. Likewise, the large-scale Women’s Marches brought people together from all walks of life. Neither yielded a sudden change in legislation or social norms. But everyone there was telling everyone who wasn’t there who’s faced injustice and inequality, ‘We hear you; You’re not alone’. Maybe it’s a coincidence that we’re seeing ongoing coverage of the 2nd Amendment debate, more attention paid to pay inequality, reassurance about victim’s rights. But the sight of thousands standing up for their rights stays in the minds of politicians and businesses who otherwise might be tempted to sidestep difficult questions. And what of other movements? Would university staff have gained any progress without leaving the negotiating table? Of course, a protest without meaningful engagement isn’t enough. Marches about student fees, welfare reform, and Brexit are yet to achieve their aims. But these marches, like the ‘March for our Lives’ and ‘Women’s march’ are part of wider movements that continue to affect people on a daily basis. When a march is about something that’s affecting thousands, even millions, it’s more than just the pictures taken that day. Sure, voting might bring in the candidate you prefer – but how else are they to be held to account? How else to remind them that broken promises and unfair pledges aren’t acceptable, and that we don’t just disappear for five years? We vote, lobby, march… and repeat.